ducky house | the quacks of Tamara Frampton Vieira: droppings from heaven they are not! 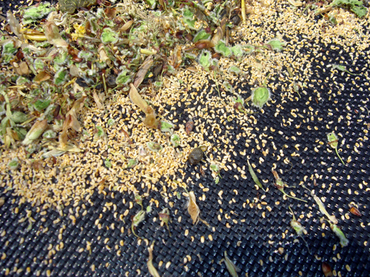 Millions of little cankerworms are going to hatch in my yard and throughout our city unless we get a wee bit of frost. It's a site not for the bug fearful. The warm weather is to blame, though typing that out after a long cold winter seems more than a bit odd. Yesterday's high was 31 celcius, that's 88 F for those who are imperially minded ;) Everywhere I look in my back yard there are tons of little larvae just waiting to grow up into long green worms, which in turn, evolve into cankerworms. All together now *yuck. * I admit I like being one with nature, but having cankerworms dropping on my head or crawling all over my "stuff" is quite another thing. Even the kids are getting a bit "bugged". 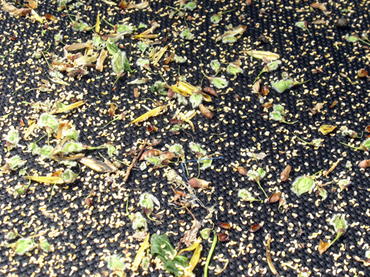 This is what we have been cleaning off our trampoline for the past 5 days. It's the kind of thing that makes my skin feel itchy. I've been scratching all day. I keep wondering how many are sitting in my hair, but my son assures me he can't see any. I hope is looking really hard, *itch, scratch, itch* My dh swept them all into a pile for a photo op. How sweet they are not! After putting a call into our local yard centre, they basically said pray for frost or mix a solution of water, dish soap & oil and spray the yard down. I decided to try both and from my end I spent over an hour spraying down my yard. It's a tedious little exercise in futility I am sure, this is where I hope the prayer part kicks in. How would one word a prayer like that "dear creator, please kill off your own creation..." Interesting dialogue at the least. Anyway, today it looks like the "bugs," as Miss A & J refer to them, are not falling as much. I hoping that is a good sign, though I'm really not up on my bug information. At the very least the ritual cleaning of my outdoor stuff is coming to an end, just in time for sticky aphid season. Uggh!